The “private” Khshayarsha had been given a royal name–but that was the only gift that he had of his family. He did not remember his father, only the story that armed men had burst into their home in the middle of the night when Khshayarsha was barely more than a baby and had taken his father away with them. The man who had been the head of the household, the man Khshayarsha might have called Father once he had learned to speak, had never returned. In the aftermath of this ruin, his mother had sat like a statue, blank-faced and silent; she had not eaten nor allowed a drop of water to pass her lips if she was not fed by another hand or forced to swallow water trickled into her mouth slowly from a chipped cup. She had clung to life even thus, stubbornly, perhaps waiting for her husband to come back against all odds–she had put forth what protection and power she had, leaving herself vulnerable and out in the open, the only target left for those who had taken her husband–but eventually she too was gone. Khshayarsha had still been too young, could not remember ever having heard the sound of his mother’s voice. It was Shahrazad who took care of him. Shahrazad, the elder sister, the only thing that stood between him and the place where both his parents had somehow vanished to and left him. 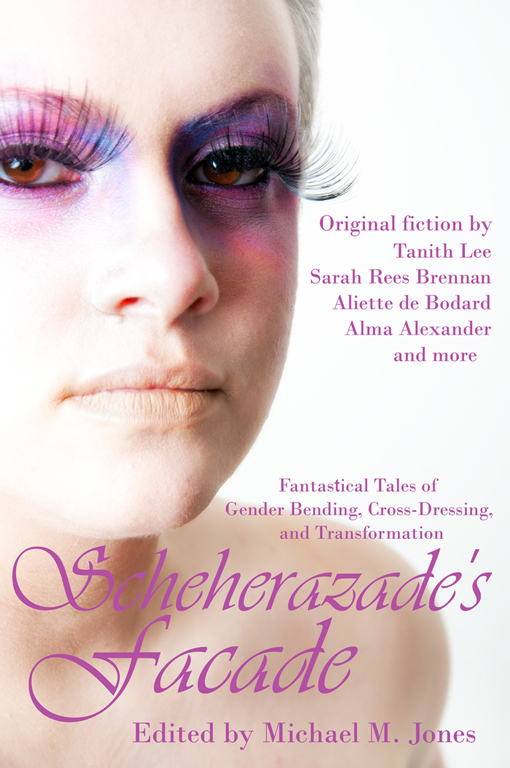 Shahrazad, who had dressed him as the girl-child their mother’s final glamour had made him seem like; Shahrazad, herself under the guise of a boy, who had smuggled him out of the place which had started to smell of death and abandonment… and taken him elsewhere, and hidden him in the dark, and told him that he must pretend–at least for a little while–to be somebody else, someone other than Khshayarsha. “A mouse?” he had offered, after a moment’s thought. “And what are you?” he had asked, rousing just a little. Even if there had been anyone to tell. They had been alone in the dark hiding place she had taken him to–the boy glamoured as girl, and the girl glamoured as boy, disguised to muddy their trail for those who still sought them–and often even she was gone, out somewhere alone, coming back with food wrapped in bazaar rags, or a skin of wine she would water down for him, or toys to amuse him in the dark. He had been too young to know his letters. He had no idea if his sister had ever been taught them or not, but she had brought the book and Mouse assumed that she knew how to read it–and so he had demanded that she read it to him, to while away the hours in which she was there with him. She said yes, and she’d sit there with him in the crook of her arm and halfway across her lap, and he had thought she would read to him. It was only later, much later, that he thought about the fact that there was little light and that she could not possibly have seen enough to read from the book she held open before them as fluently as she told her stories. Much later, when she was long gone. It was much later, too, that he realized that she had been telling him only the truth–his favorite stories were those about Desert Fox, which was her own secret name between the two of them, and there could have been no stories written about the deeds of the Desert Fox in a book like the one she had brought back into their lair. Know, then, O Mouse, that Desert Fox went out into the streets of the city in the daytime, dressed as a dirty street boy, the hair that had been her pride hacked untidily away just above her shoulders and swinging in matted tangles from underneath a sloppily tied head-cloth. The streets were rough and dangerous, and there was a language to them all of their own–and maybe a language that changed subtly if you rounded a corner and turned into a new street. And it all had to be learned. And it was tough out there for one who was also learning to thieve cheese and day-old unleavened bread and olives for the Mouse she kept safe in the secret den where Fox lived… to which she must never, ever, not even accidentally draw anyone’s eye for the Mouse was a Prince of his nation and would have to be kept safe from harm. In the beginning Mouse was young enough to endure his dark prison–the Desert Fox would take him out sometimes, at night, into streets empty of people, and wander with him on the cobbles still slimed by that day’s market offal, and then away, into winding streets with high walls and secret gates and fragrant gardens whose scents spilled over the walls and into the street below. To read the rest, buy the paperback or ebook today!